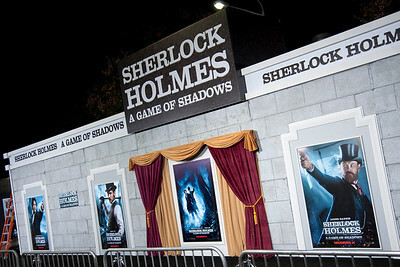 The premiere of Warner Bros. Pictures' 'Sherlock Holmes: A Game Of Shadows' held at the Regency Village Theatre in Westwood, California. 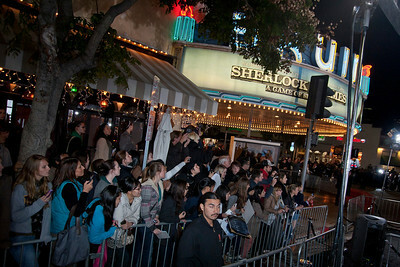 WESTWOOD, CA: Atmoshphere at the premiere of Warner Bros. Pictures' 'Sherlock Holmes: A Game Of Shadows' held at the Regency Village Theatre in Westwood, California. Photo taken on Tuesday, December 6, 2011 by Tom Sorensen/Moovieboy Pictures. 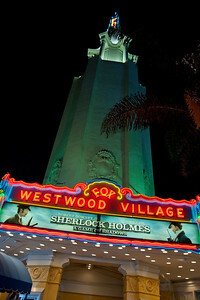 WESTWOOD, CA: The Gofobo Human arrives at the premiere of Warner Bros. Pictures' 'Sherlock Holmes: A Game Of Shadows' held at the Regency Village Theatre in Westwood, California. Photo taken on Tuesday, December 6, 2011 by Tom Sorensen/Moovieboy Pictures. 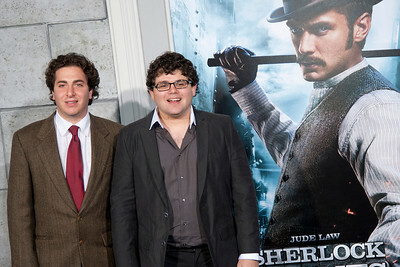 WESTWOOD, CA: Actors Jonathan Brown and Oliver Cooper arrive at the premiere of Warner Bros. Pictures' 'Sherlock Holmes: A Game Of Shadows' held at the Regency Village Theatre in Westwood, California. Photo taken on Tuesday, December 6, 2011 by Tom Sorensen/Moovieboy Pictures. 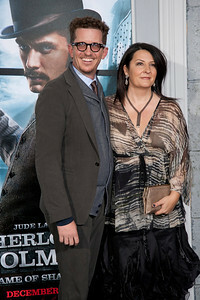 WESTWOOD, CA: Allegra Riggio and actor Jared Harris arrive at the premiere of Warner Bros. Pictures' 'Sherlock Holmes: A Game Of Shadows' held at the Regency Village Theatre in Westwood, California. Photo taken on Tuesday, December 6, 2011 by Tom Sorensen/Moovieboy Pictures. WESTWOOD, CA: Actor Miles Teller arrives at the premiere of Warner Bros. Pictures' 'Sherlock Holmes: A Game Of Shadows' held at the Regency Village Theatre in Westwood, California. 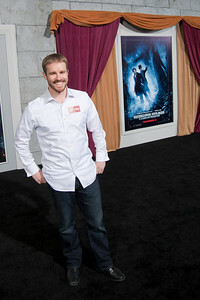 Photo taken on Tuesday, December 6, 2011 by Tom Sorensen/Moovieboy Pictures. 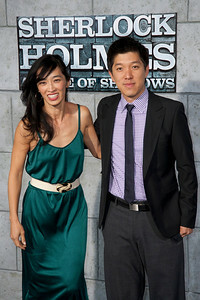 WESTWOOD, CA: Sophia Lin and Producer Dan Lin arrive at the premiere of Warner Bros. Pictures' 'Sherlock Holmes: A Game Of Shadows' held at the Regency Village Theatre in Westwood, California. Photo taken on Tuesday, December 6, 2011 by Tom Sorensen/Moovieboy Pictures. 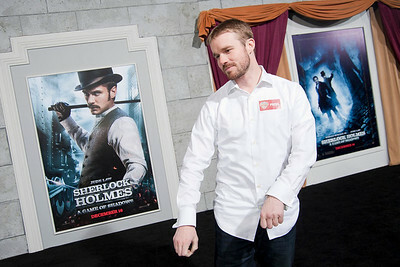 WESTWOOD, CA: Screenwriters Kieran Mulroney and Michele Mulroney arrive at the premiere of Warner Bros. Pictures' 'Sherlock Holmes: A Game Of Shadows' held at the Regency Village Theatre in Westwood, California. Photo taken on Tuesday, December 6, 2011 by Tom Sorensen/Moovieboy Pictures. 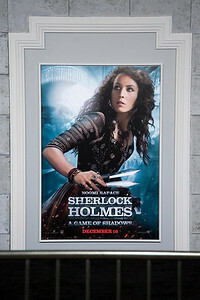 WESTWOOD, CA: Actress Noomi Rapace arrives at the premiere of Warner Bros. Pictures' 'Sherlock Holmes: A Game Of Shadows' held at the Regency Village Theatre in Westwood, California. Photo taken on Tuesday, December 6, 2011 by Tom Sorensen/Moovieboy Pictures. WESTWOOD, CA: Actress Nicole Bloom arrives at the premiere of Warner Bros. Pictures' 'Sherlock Holmes: A Game Of Shadows' held at the Regency Village Theatre in Westwood, California. Photo taken on Tuesday, December 6, 2011 by Tom Sorensen/Moovieboy Pictures. WESTWOOD, CA: Actress Rachel McAdams arrives at the premiere of Warner Bros. Pictures' 'Sherlock Holmes: A Game Of Shadows' held at the Regency Village Theatre in Westwood, California. Photo taken on Tuesday, December 6, 2011 by Tom Sorensen/Moovieboy Pictures. 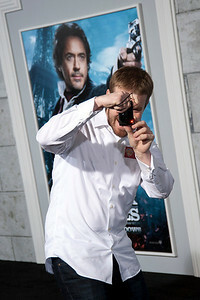 WESTWOOD, CA: Actor Robert Downey Jr. and producer Susan Downey arrive at the premiere of Warner Bros. Pictures' 'Sherlock Holmes: A Game Of Shadows' held at the Regency Village Theatre in Westwood, California. Photo taken on Tuesday, December 6, 2011 by Tom Sorensen/Moovieboy Pictures.